Live - well, and live well - even better, as would say one of our favorite characters. And he is very right. I will allow myself one more free paraphrase: "Life must be lived there, that was not painfully ashamed of wasted years." Of course, Nikolai Ostrovsky mean "SO", but, in this case, "There" is more appropriate, because our will to choose the place where we were, quite possibly, will be much more comfortable than at home. Trying to change your Horoscope - empty fun, because it is not given to everyone, but to choose a place where to live, by any forces. It would be a desire, and sometimes a great desire. Nevertheless, in astrology there is a methodology, which allows to find a place where people will feel more comfortable and be able to express and realize themselves. To do this, and this is astrological program. Live and powerful mapping, which allows to find not only the locality, but also the house. Display favorable regions, not only the conjunction lines. A wide range of map sets. Ability to instantly assess your chart for a new place. The original method of forecasting events. Integration program with all the Galaxy program. 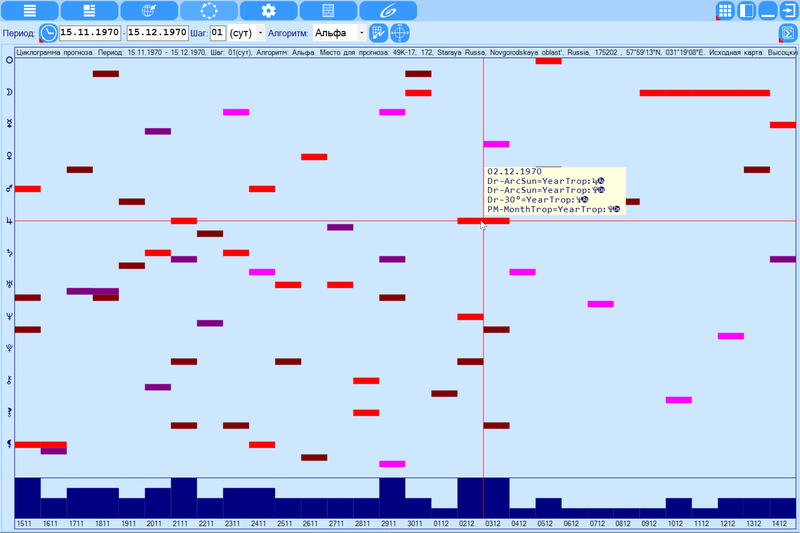 Viewing events with different tools during the period. List of charts is much easier to work with the charts, allowing you to create (download) a plurality of charts for the total consideration or comparison. Selection of tools for forecasting. 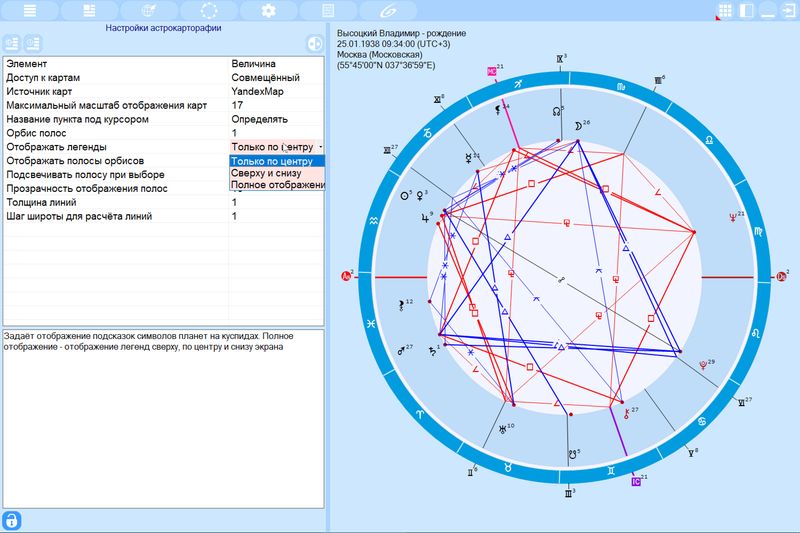 Allows you to select astrological tools to calculate the forecast cycle to get an answer to the question "When an event can be activated". Work with astrocartography - Selection of objects on cusps. Selecting objects on the cusps allows you to display only the necessary combinations of planet-angular cuspid pairs to unload the map on small scales. 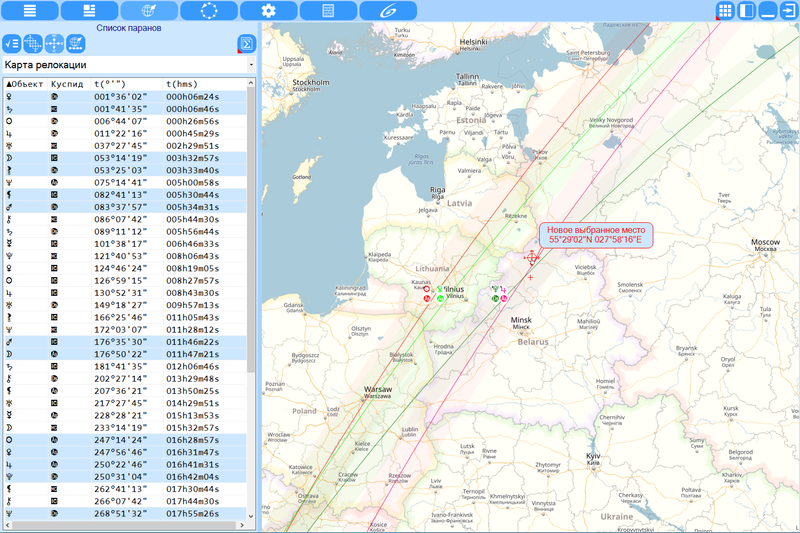 When you change the scale of the legend map (the hints are always accompanied by the lines of the object-cuspid, and when you hover the cursor on the line, it is highlighted and a tooltip appears on the line. Relocation chart and natal chart for comparing the position of objects in houses. The location of the relocation is displayed in the form of an astrological map icon. When you move the cursor to this icon, you can get information about the current location. As the scale of the map increases, the line of the line's orbis becomes visible, which can be set in the settings. Work with astrocartography - List of paranes. Direct ascension in degrees or hours. 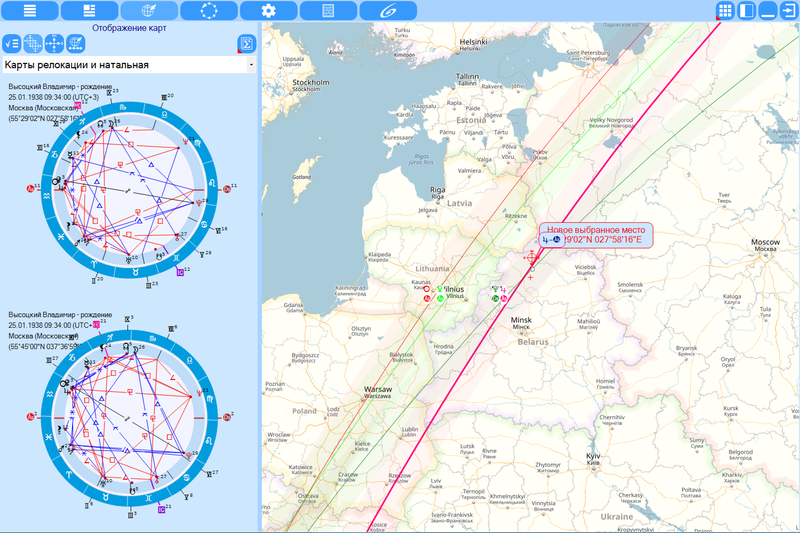 Work with astrocartography - Coordinate points. The mechanism of coordinate points allows you to quickly return to the specified (previously saved) location of relocation, which greatly facilitates the consideration and comparison of several places on the map. Coordinate point lists can be saved for further work. When you click on the map, you can get enough detailed information on the point up to the postal address, which allows you to find the necessary places for relocation to the house. 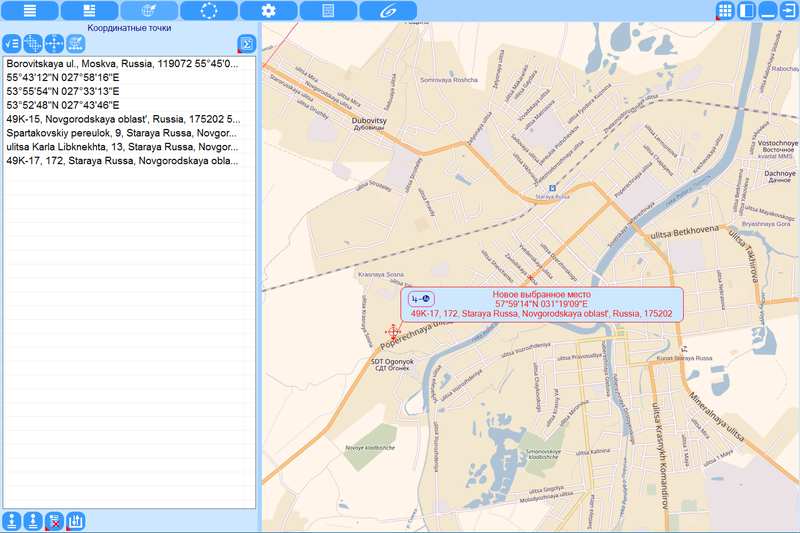 Allows you to answer the question "When" can activate the map in the place of relocation. The cyclogram allows you to display the planet-cuspid pairs in the time period under consideration with a given step. 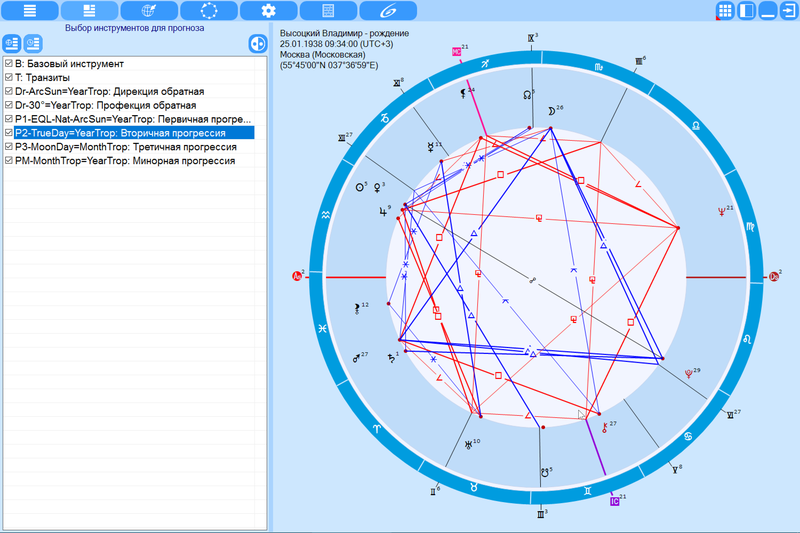 In this case, the angular cusps are displayed in the same colors as in the natal chart, which greatly facilitates the perception of information. Since each planet can be on one of the 4 angled cusps at the same time for the same astrological instrument, then certain places are allocated for them. The chart at the bottom of the chart shows the total number of pairs positions at the selected point. The more these pairs are for a given time point, The greater the moment of time. This can indirectly answer the question "When". 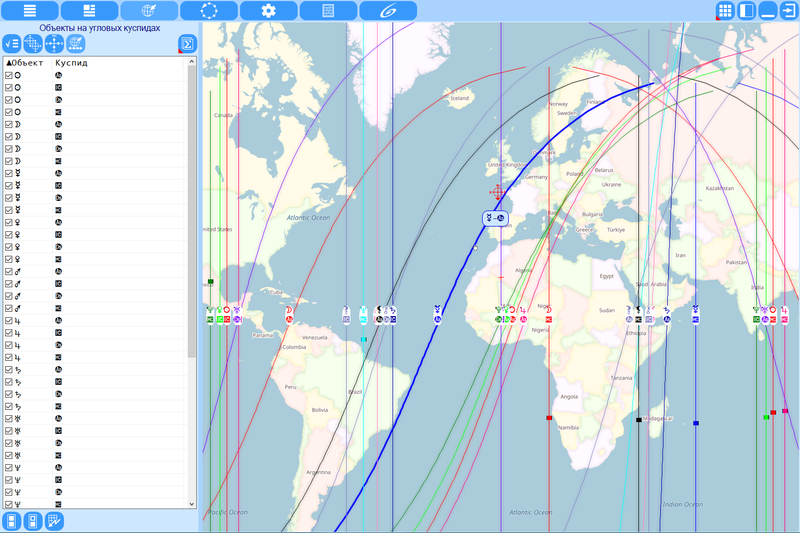 With a double click around the crosshair, you can get detailed information on the selected date - with which astrological tool at a given point which of the planets hits the corner cusp, which allows you to comprehensively assess the impact of the selected date at the time the event occurred.